he new model 45-20P is equipped with the same popular and powerful motorhead equipped in the model 45-10P but with a tank capacity that reaches 20 gallons. With 105 inches of waterlift and 110 CFM, it will provide fast, high volume pick-up of all kinds of heavy wet or dry materials. For liquids, a drain hose allows emptying of a full tank in a few seconds. A molded-in handle and large rear wheels make transporting over congested, debris-ridden job sites a breeze. 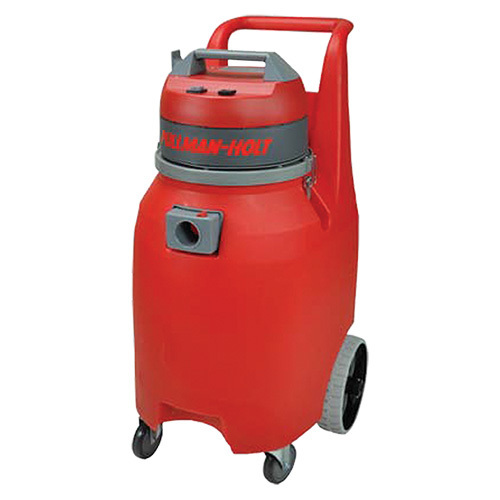 Includes a complete assortment of floor attachments and above floor dusting tools. For large area recovery of liquids, an optional front-mounted squeegee assembly is available. Two horsepower, commercial grade, two-stage, bypass motor for superior pick-up and long service life. High efficiency cloth filter bag maximizes airflow and reduces interruptions due to filter clogging. Positive locking, swivel hose connection prevents hose binding during vacuum operations. Roto-molded poly tank has a no-stoop, built-in handle, large rear wheels and front swivel casters for excellent mobility, even with a full tank of liquids. Built-in sound suppression allows for operation in public, noise sensitive areas. 50-foot cord allows wide area vacuuming without changing outlets.